MERCATOR - Asia ex magna Orbis terre descriptione Gerardi Mercatoris. . .
MERCATOR, G./ HONDIUS, J. - Asia ex magna Orbis terre descriptione Gerardi Mercatoris. . .
Asia ex magna Orbis terre descriptione Gerardi Mercatoris. . . - MERCATOR, G./ HONDIUS, J. 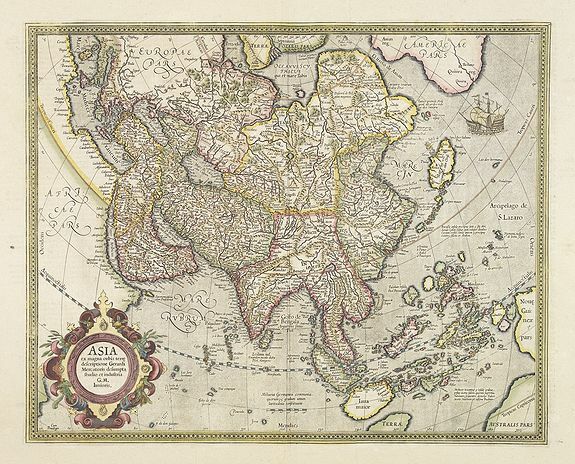 Title : Asia ex magna Orbis terre descriptione Gerardi Mercatoris. . .. Size : 14.8 x 18.3 inches. / 37.5 x 46.4 cm. Description :The cartography derives directly from the 1569 Mercator world map and includes the southern landmasses of New Guinea and Terra Australis, the East Indian Islands, the Philippines and a strange roundel kite-shaped archipelago of Japan. The coasts of North East Asia and North West America are separated by Gastaldi's fabled Straits of Anian, where a well-placed galleon provides speculation as to the possibilities of an Arctic route to the Indies. Sweet, Mapping the continent of Asia, 13.